Plaintiff's attorney Garo Mardirossian details the extent of his client's injuries during his closing argument. Click here to see video from the trial. Los Angeles - A California state court jury on Monday awarded $35 million to a former UCLA football player who lost his leg in a traffic collision who claimed the accident was caused by a dangerous intersection that the California Department of Transportation knew posed a risk to drivers. The jury deliberated for nearly three days after hearing testimony in a lengthy trial that began before Thanksgiving. The panel held Caltrans responsible for injuries suffered by Amir “Nick” Ekbatani in 2012 when his motorcycle was struck by a taxi van that failed to yield the right-of-way while making a left turn. Jurors assigned Caltrans 70 percent responsibility for the accident and the van’s driver, Mesfin Kinfu, 30 percent. Ekbatani reached a confidential settlement with Kinfu before the start of the trial, meaning the actual amount of damages Ekbatani can receive is reduced to $27.5 million. Ekbatani’s attorney Garo Mardirossian argued that Caltrans knew for years about poor visibility at the intersection between the Pacific Coast Highway and Diamond Street in Redondo Beach and failed to take action, while Caltrans attorneys maintained the accident was entirely Kinfu’s fault. Mardirossian sought damages in excess of $50 million. Ekbatani played as a lineman for UCLA from 2006-2009. He then went on to earn an MBA and made appearances on ESPN. The trial was webcast and recorded gavel-to-gavel by Courtroom View Network and is available as part of CVN’s one-of-a-kind online video archive of high-stakes civil trials. During his closing argument, Mardirossian told jurors that Caltrans should have taken extra precautions to protect motorists at the intersection, which he described as “skewed” because Diamond Street crosses PCH at a sharp diagonal angle. A left turn signal and a simulated median formed by double-yellow lines could have prevented the crash but weren’t added, he argued. As a result, Mardirossian said Ekbatani, now 29, endured 13 surgeries and now always carries a backpack filled with supplies to help him tend to his prosthetic limb. Caltrans attorney Jill Siciliano argued throughout the trial that the intersection is not dangerous, and that the transit agency should not be held responsible for its design because they inherited it decades ago from Los Angeles County. The county designed the highway, and no fatal accidents have occurred at the intersection in question in over 20 years. Mardirossian countered those arguments by suggesting that while no fatal accidents occurred at the intersection, Caltrans received numerous warnings about the intersection’s risks. He played video depositions from two citizens who filed complaints about the intersection, that he said should have warned Caltrans about the potential for collisions. “I really thought they needed a left-turn signal,” 90-year-old Renee Soiffer said during her deposition. Soiffer worked at the nearby Redondo Beach Main Library in 2005 and testified that she contacted the mayor’s office after witnessing numerous accidents at the intersection. “I thought it was a dangerous intersection for many people,” she said. Mardirossian played testimony from Russell Smith a driver who blamed poor visibility at the intersection for a 2005 accident. He also claimed police officers raised concerns about the intersection as far back as 2001, but Siciliano claimed Caltrans only received the complaint from Soiffers. The trial featured testimony from UCLA athletic director Dan Guerrero, who told jurors that Ekbatani has suffered tremendously despite maintaining an outwardly cheery demeanor. "When you see Nick ... he always has this upbeat persona and inspirational demeanor about him that is infectious," Guerrero said. "You really don't know what he's going through because of how he presents himself in public." 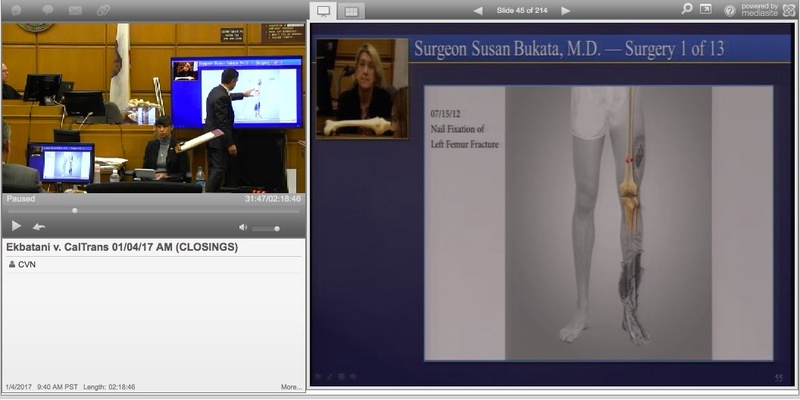 Jurors also viewed video of deposition testimony from UCLA football coach Jim Mora. Mora originally planned to testify in person but was unavailable due to a recruiting trip. He coached Ekbatani from 2006 to 2009 and like Guerrero, described how Ekbatani faced enormous obstacles despite his determination to move on with his life. "He was a scared young man who was trying to put on a brave face," Mora said in his deposition. The trial took place before Judge Anthony Mohr, and the full gavel-to-gavel proceedings are available online via CVN, along with hundreds of other trials from throughout California and across the country. The case is Ekbatani v. United Independent Taxi Drivers, et al., case number BC504902.